When most directors repeat themselves, it's typically a sign of artistic exhaustion or perhaps unshakable fixation. In Wes Anderson's case, his visual repetition has become an irresistible thumbprint, and one of the great moviegoing joys I've encountered in recent years is the opportunity to watch this supremely gifted filmmaker use his leather-bound imagination to impart varying stories of eccentric outsiders and their enduring emotional wounds, with each film connected by exotic aesthetic degrees of detail-oriented splendor. 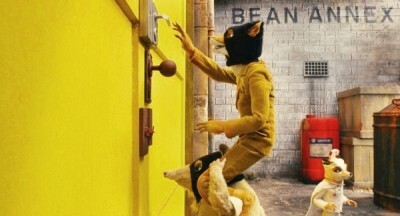 Now Anderson takes his cinematic language to the hand-woven field of stop-motion animation for "Fantastic Mr. Fox," and, yet again, the filmmaker shapes a breathtaking cinematic marvel; he finds a magnificent home nestled firmly in the luxurious textures of the animation, the dancing vocal performances, and delicious wry tone that makes for stunningly fanciful cinema. Taking a day job as a newspaper columnist to support his wife Felicity (voiced by Meryl Streep) and son Ash (Jason Schwartzman), Mr. Fox (George Clooney) has grown tired of suppressing his animal instincts. Planning to infiltrate the chicken and cider farms of the feared Boggis, Bunce, and Bean (Michael Gambon), Mr. Fox and opossum partner Kylie (Wallace Wolodarsky) spring into action, finding the thrill of the steal irresistible. When the heavily armed Bean vows revenge on Mr. Fox, the gruff farmer tears the countryside apart looking for his sly enemy. Digging into the ground, Mr. Fox drags the locals into the fight, leaving the wolf-fearing hero responsible for the community, pushing him to come up with a plan to outwit the unrelentingly combative humans. Emerging from the divine mind of author Roald Dahl ("Charlie and the Chocolate Factory," "James and the Giant Peach"), "Fantastic Mr. Fox" offers Anderson a hefty slice of whimsy to work with. The filmmaker sticks surprisingly close to Dahl's plot, showing enormous reverence for the author's dark tones and natural animal behaviors. Where Anderson's imagination deviates from Dahl is in the neurotic delivery. Taking idiosyncratic motifs established in such films as "The Royal Tenenbaums" and "The Life Aquatic with Steve Zissou" to the family film arena, Anderson unveils a sure gift for the genre. That's not to suggest the filmmaker has watered down his sense of mischief to make a PG animated film; in fact, "Fantastic" retains a nice edge -- think "Wallace and Gromit" but with flicked cigarettes, dance parties, shoot-outs, and severed fox tails. Anderson conforms to the softer side of the material, having the characters cuss by actually stating the world "cuss" when the mood strikes, and investigating young Ash's malformed sense of purpose, aggravated by the appearance of cousin Kristofferson (Eric Chase Anderson), a fox of the same age who can do no wrong. Anderson, scripting with Noah Baumbach, leans into the merry attitude of Mr. Fox, arranging an adventure film teeming with the sort of frame minutiae the filmmaker is well known for. The world of stop-motion animation only emboldens Anderson's fetish, indulging in this vast world of miniature animals living in miniature homes, fitting Dahl's characters for new clothes and a hipper soundtrack (which includes The Rolling Stones, The Beach Boys, and "Love," a cut from the other major fox family film, Disney's "Robin Hood"), taking his primary colored American Empirical conceptualization to an exhilarating level of visual elasticity and creativity. The animation effort is stunning, not only for its playfulness and brilliant fluidity, but also the soft fur textures of the characters, which almost require a reflexive reach toward the screen to sate curiosity. It's 3-D with 2-D tools, molding a resplendent storybook visual handle to a clever, urban comedy. The ornate decoration goes beyond the animals to the entire "Fantastic" world, teeming with design particulars that will require weeks of study, just to digest how much wit and affection Anderson has crammed into the vast corners of this outstanding picture. 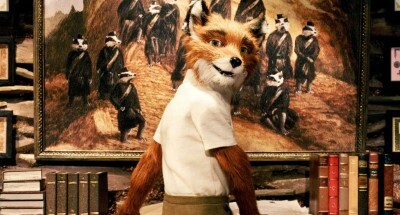 Clooney's spirited voice work pulls "Fantastic" in a few unexpected directions, humorously teetering between Mr. Fox's domesticated leadership skills and his feral nature, typically unleashed around food and domestic containment. 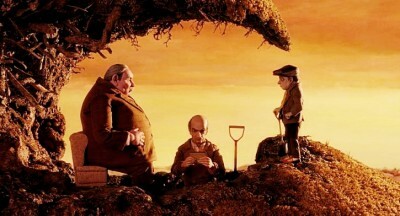 Anderson's stocked the rest of the roles with a dynamic range of vocal personalities, with Streep offering a velvety counterpoint to Clooney's gravely enthusiasm, and Schwartzman and Anderson enjoying the battle of popularity and Whack-Bat skills as the disgruntled child and his more Zen relative. Anderson's even called in a few favors from old friends (Owen Wilson, Bill Murray, Willem Dafoe, and Brian Cox also appear) to help personalize the piece. If "Fantastic" wasn't such a graciously hilarious picture, didn't highlight superb actors embracing their animal instincts with undiluted charm, and failed to execute its cleverness in an endearingly loopy fashion, there would still be this monumental, brilliantly raw animated effort to examine intensely and gleefully. 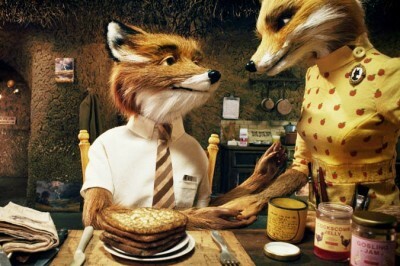 Thankfully, Wes Anderson has prepared the full course cinematic meal with "Fantastic Mr. Fox," confidently shaping his latest triumph of creative agility and complex design, sacrificing nothing in the transition to the animated realm. In fact, it's possibly rekindled his roguish ways after the slack 2007 film, "Darjeeling Limited," encouraging his polite auteurist grandeur to find new outlets to devour.